1. Take Control of Your Local Listings. Claim your business's local listings (Google My Business, Bing Places, Yahoo Small Business). Once you have access, complete all of the necessary information for each listing (hours, phone number, website, social pages, service mileage, business category and more). Update your N.A.P. (Name Address Phone) across the web. 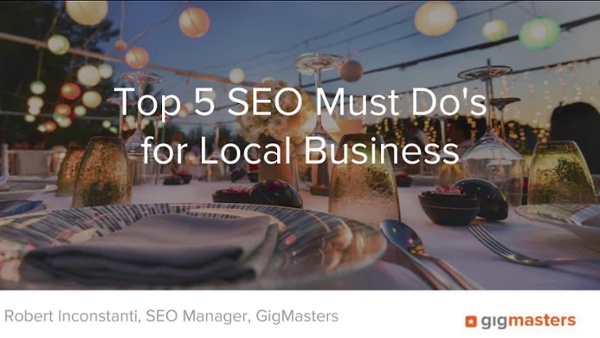 It's an important signal when it comes to local business that should be accurate and consistent everywhere on the web. -site:yoursite.com “yourbusiness” in Google. (This would look like: -site:gigmasters.com "gigmasters" for GigMasters) Google will crawl the web and search all pages (except for your website) where you are listed or talked about so you can see if the information about your business is correct. If it's not, reach out to the site to get it updated. Get 5, 5-star reviews on your listings. This helps boost local listing visibility in Google search and of course, builds credibility with potential clients. 2. Get Your Site's Historical Data. Get your site's historical data so you can understand how search engines like Google are crawling your site, if they're hitting errors, how often you're appearing in search results, your average keyword position, what keywords you're ranking for, and more. There are two main search tools out there. Go to the URLs below and claim your site so you can access this data. You'll be able to look at 16 months of historical data. 3. Get Google Analytics on Your Site. Set up Google Analytics for your business's website if you don't already have it. Go to analytics.google.com. It's free! You'll get a lot of information about how users interact with your actual website and not just Google's data. You can see real-time traffic data and where it's coming from (social, organic, etc. ), demographic data, and more. Utilize Google Analytics Academy's free courses to learn more: analytics.google.com/analytics/academy. 4. Look at What's Going on in Search Results. Search for your business in Google and see what comes up. If you're on GigMasters, you'll probably see that you're pretty high up in organic search. Evaluate the copy in your search results, where you fit in, what type of pages are coming up, etc. Compare your content to others that might be coming up higher and see what you can do better while keeping your content new and unique. It's important to note that Google by default personalizes searches depending on the user, so you won't always see the same results as other users. 5. Piggyback on Other Ranking Sites. Search is very competitive. There are hundreds of secretive rankings that Google uses, but the key is to focus on good content. Make sure you're putting out valuable information that matches what you do and your users' needs. Attach yourself to pages that are already ranking high. If it's a news outlet, reach out to them and see if they'll do an article on you or link to your page. Backlinks are great for SEO because it gives a trust factor. Piggyback on ranking sites like GigMasters that have years of experience and success with ranking high organically in search results. Not a GigMasters member? We pride ourselves in coming up high in search results to give you maximum visibility to potential clients. We stay focused on getting you more exposure so you can focus on getting booked! Learn more.